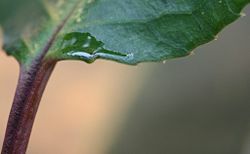 In botany, nectar is a sugar-rich liquid secreted by plants that serves to attract and feed animals, whether as an adaptation for reproduction or protection purposes. It is produced in glands called nectaries (singular; nectary). Nectar either is produced by flowers in floral nectaries, in which it attracts pollinating animals, or by extrafloral nectaries, which provide a nutrient source to animal mutualists providing anti-herbivore protection or other benefit to the plant. In Greek mythology, nectar refers to drink of the Gods. The term is derived from Latin nectar, for "drink of the gods," which in turn has its origins in the Greek word νέκταρ (néktar), presumed to be a compound of the elements nek- "death" and -tar "overcoming." The earliest recorded use of its current meaning, "sweet liquid in flowers," dates back to 1609 (Harper 2001). Nectar is produced by a plant not as an energy or nutrient source for the plant itself, but rather for consumption by various nectarivores (nectar-eating animals, such as insects, birds, mammals, and lizards). Thus, while nectar-producing plant species are advancing their own survival and reproduction, they also are contributing something of value to others (the ecosystem and/or human beings). In turn, many of these benefiting animals provide a benefit for the plant species, reflecting a sense of unity and harmony in nature. For humans, nectar is economically important as the sugar source for honey. It is also useful in agriculture and horticulture because the adult stages of many predatory insects, as well as hummingbirds and butterflies, feed on nectar. A nectary is a plant gland that secretes nectar. These may be floral nectaries, usually found within the base of the flower, or extrafloral nectaries, located on other portions of the plant. Floral nectaries are generally located at the base of the perianth and are used to attract pollinating animals, such as bees, birds, or bats. They are positioned in such a way that pollinators seeking the nectar will brush the flower's reproductive structures, the anthers and pistil, while accessing the nectar. This allows the transfer of pollen grains (male gametes) from the male reproductive organ to the female reproductive organ that contains the ovule (female gamete) or transfers it to the ovule itself. Extrafloral nectaries (EFN) are nectar-producing plant glands located physically separate from the flower, or if near reproductive parts, are not involved with pollinators. More than 2000 species of plants, in more than 64 families, have been show to have extrafloral nectaries (Mizell 2004). These may be located on the leaf petioles, leaf laminae, rachids, bracts, stipules, pedicels, and fruit, among other places (Mizell 2004). The composition of the nectar is about ninety-five percent sugar (glucose, fructose, sucrose) with the remaining five percent consisting of amino acids and other important nutrients (Mizell 2004). Its content differs from floral nectar (Mizell 2004). Nectar produced outside the flower is generally made to attract predatory insects, such as ants. These predatory insects will eat both the nectar and any plant-eating insects around, thus functioning as "bodyguards" (Wäckers et al. 2005; Mizell 2004). It is also hypothesized that extrafloral nectaries may act as an excretory organ for removal of metabolic wastes (Mizell 2004), or that it could draw away visiting animals, such as ants, from foraging at floral nectaries or for attracting ants to help in distributing the seeds of the plants. 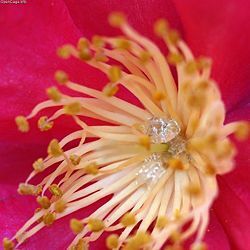 Extrafloral nectaries can be found on species belonging to, among others, the genera Salix, Prunus, and Gossypium. The passion flower (Passaflora sp. ), elderberry (Sambucus spp. ), and hairy vetch (Vicia sp.) are plants known to have large extrafloral nectaries on their leaves and/or stems that are easy to locate (Mizell 2004). In zoology, a nectarivore is the term for an animal that eats the sugar-rich nectar produced by flowering plants. Most nectarivores are insects or birds, but there are also nectarivorous reptiles, and mammals, notably various species of bats. The term nectarivore is less exclusive than other -vores; many animals that are considered nectarivorous may also be insectivorous. Many species are nectar robbers, performing no pollination services to a plant while still consuming nectar from the floral nectaries. Non-flying mammals (to distinguish them from bats), including marsupials, primates, and rodents, have been found to feed on the nectar of several species of plant. Though some of these mammals are pollinators, others do not carry or transfer enough pollen to be considered pollinators (Johnson et al. 2001). Plant species that feed bats and non-flying mammals for pollination purposes will often produce a large amount of sugar-rich nectar. One example of rodent nectarivores is four rodent species found to feed on the nectar of the African Lily, Massonia depressa, while also providing pollination benefit for the plant. M. depressa has dull-colored and very sturdy flowers at ground level, has a strong yeasty odor, and secretes copious amounts of sucrose-dominant nectar during the night (Johnson et al. 2001). The nectar of M. depressa was also found to be 400 times as viscous, or resistant to flow, as an equivalent sugar solution. This jelly-like consistency of the nectar may discourage insect consumption while also facilitating lapping by rodents. The Australian honey possum, T. rostratus, is one of the very few entirely nectarivorous mammals. This marsupial has a long, pointed snout and a long, protusible tongue with a brush tip that gathers nectar and pollen. The lizard Hoplodactylus is only attracted by nectar on flowers, not pollen. Flowers pollinated by this species produce copious nectar as a reward for Hoplodactylus. Geckos (genus Phesulma) in Mauritius are another example of a nectarivorous reptile. Nectar source is the term for a flowering plant that produces nectar. In addition to the benefit they provide animals, nectar source plants are important for beekeeping, as well as in agriculture and horticulture. Their use is particularly important for organic agriculture and organic horticulture, where they serve not only to attract pollinators for crops, but also provide habitat for beneficial insects and other animals that provide pest control. In gardens, nectar sources are often provided to attract both butterflies and hummingbirds. Nectar sources for honeybees. While many plants produce nectar, beekeepers prefer to place their hives near certain plants, rather than others, for the qualities of the honey produced. Certain agricultural crops, such as clover and buckwheat, are used to make specific honeys. Some plants are avoided by beekeepers due to toxins found in the nectar. For example, honey made from the nectar of Rhododendrons ("mad honey") contains neurotoxic chemicals. Nectar sources for pollination. Pollinating insects, including honeybees and many other insects, are a necessary element when growing most crops (though cereal grain crops are wind-pollinated). By maintaining a constant supply of nectar in areas adjacent to a field or vegetable garden throughout the growing season, farmers and gardeners ensure that their crops can be pollinated when they flower. Nectar sources for beneficial insects. Particularly organic horticulture and organic farming use nectar sources to attract and maintain a population of beneficial insects. Insects such as predatory wasps, hoverflies, and lacewings feed on nectar as adults, while their larval forms are predatory and feed on garden pests. Nectar sources for butterflies and hummingbirds. In gardens, the presence of butterflies and hummingbirds is often encouraged. Butterflies are attracted by most good nectar sources, though there are particular plants they seem to prefer. Certain plants are also grown as a food source for their caterpillars. Hummingbirds feed on tubular flowers, using their long, siphoning beaks. Many plants in the mint family, Lamiaceae, are used to attract hummingbirds. Images of a Mimulus flower in visible light (left) and ultraviolet light (right) showing a dark nectar guide, visible to bees but not to humans. Nectar guides are patterns seen in some flowers that guide pollinators to the nectar and pollen. These patterns are sometimes visible to humans; for instance, the Dalmatian toadflax (Linaria genistifolia) has yellow flowers with orange nectar guides. However, in some plants, such as sunflowers, they are visible only under ultraviolet light. Under ultraviolet, the flowers have a darker center, where the nectaries are located, and often specific patterns upon the petals as well. This is believed to make the flowers more attractive to pollinators such as honeybees and other insects that can see ultraviolet (IDEA 2008). The ultraviolet color, invisible to humans, has been referred to as bee violet, and mixtures of ultraviolet with shorter (yellow) wavelengths are called bee purple by analogy with purple in human vision (Micheneer 1974). Harper, D. 2001. Nectar. Online Etymology Dictionary. Retrieved April 20, 2008. Institute for Dynamic Educational Advancement (IDEA). 2008. Butterflies. Webexhibits.org. Retrieved April 20, 2008. Johnson, S. D., A. Pauw, and J. Midgley. 2001. Rodent pollination in the African lily Massonia depressa (Hyacinthaceae). American Journal of Botany 88: 1768-1773. Michener, C. D. 1974. The Social Behavior of the Bees: A Comparative Study. Harvard University Press. ISBN 0674811755. Mizell, R. F. 2004. Many plants have extrafloral nectaries helpful to beneficials. Department of Entomolgy and Nematology, Florida Cooperative Extension Service, Institute of Food and Agricultural Sciences, University of Florida. Retrieved April 20,2008. Wäckers, F. L, P. C. J. van Rijn, and J. Bruin. 2005. Plant-Provided Food for Carnivorous Insects: A Protective Mutualism and its Applications. Cambridge University Press. ISBN 0521819415. This page was last modified on 20 August 2008, at 21:13.